Dr. Nancy Mills was a Murchison Professor (2011-2014) at Trinity University. She received her PhD in Chemistry from the University of Arizona and she spent a few years teaching at Carleton College in Minnesota before joining the faculty at Trinity. Nancy has received many awards and honors during her career, including selection as a Council on Undergraduate Research Fellow, the Distinguished Achievement Award in Scholarship from Trinity University, the American Chemical Society Award for Research at an Undergraduate Institution, and the Piper Professor state-wide teaching award. She has also been elected as a Fellow of the American Chemical Society, a Fellow of the American Association for the Advancement of Science, and a Z. T. Scott Faculty Fellow at Trinity in recognition of outstanding teaching. Nancy is with us today to tell us all about her journey through life and science. In addition to her love of science, Nancy enjoys reading mystery books, cooking, and ultralight backpacking. She works at a primarily undergraduate institution as an organic chemist. Typically organic chemists make things like drugs or polymers. When trying to make things, they really focus on making stable compounds. Nancy has actually created a rare unstable (anti-aromatic) compound that does not turn into a stable one. “Remember, the journey is the reward.” from Nancy’s husband. Surprisingly, Nancy wasn’t actually that enthusiastic about chemistry as a child. She had her dad’s old chemistry set, but spent more time doing “girl stuff” than mixing chemicals. In college, Nancy decided she should do science because chemists were considered smart and if she became a chemist, she would be considered smart. One of her biggest struggles involved the unstable anti-aromatic compounds which were essentially compounds other people didn’t believe could exist. First she had to convince herself what she was seeing was right by making a lot of the compound, but then she had to figure out how to convince others that she was right. Nancy spent four years doing every experiment she could think of before publishing her findings. She views training students as one of her biggest successes. When Nancy first started as a faculty member, she attended the American Chemical Society meetings, and it was an incredible and transformative experience. Some of these early meetings were also in Hawaii which was nice and probably explained why there weren’t always very many people in the audience. Nancy usually has a group of students working in her lab over the summer and they made a tradition of Friday Fun Days. They usually appoint one or two social chairs who plan the themes and outings each weeks. They do tie day and go out for Thai food and they always have a pirate day. They now have an extensive collection of pirate attire in the lab that they all wear out to lunch to celebrate. Think about finding mentors who will help you further your career and if you are further along in your career, think about being a mentor for younger colleagues. Trinity University, a predominantly undergraduate institution in San Antonio. As a result, Nancy’s career at Trinity University has allowed a great balance of teaching, research, and service. Her research program involves the discovery of antiaromatic ions. These species were anticipated to be so unstable that they were rarely considered as research subjects and even less frequently prepared. But, due to an unexpected experimental result, Dr. Mills has developed the largest group of antiaromatic dications and dianions, and is using them to provide insight into some of the “workhorse” principles of organic chemistry. She has had continuous external funding since 1980, from the Research Corporation, the Petroleum Research Fund of the American Chemical Society, the National Science Foundation, and the Welch Foundation, which supports chemical research in Texas. In the area of service, she was a Councilor of the Council on Undergraduate Research (www.cur.org) for a decade and chair of the chemistry division. 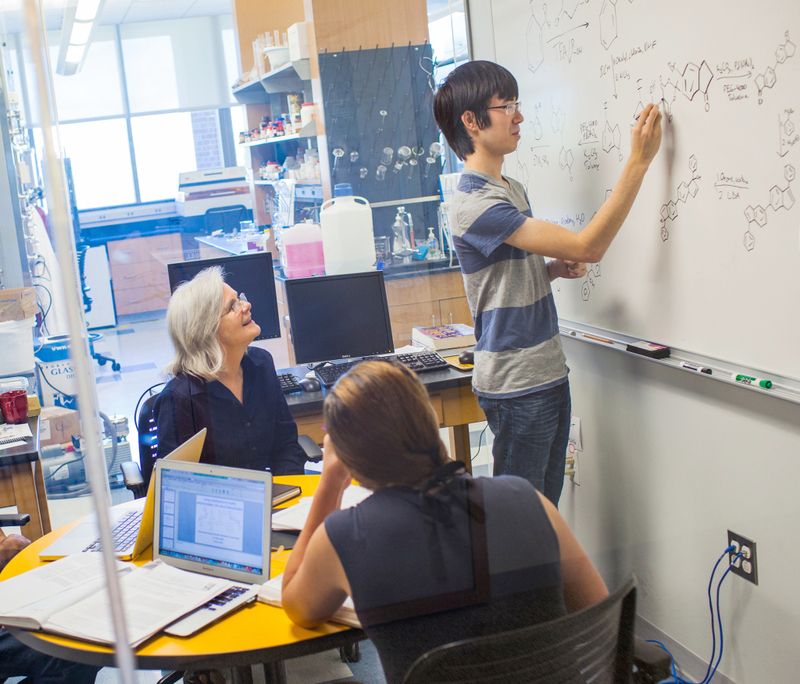 During this time she started a Mentor Network in Chemistry, which guides faculty at undergraduate institutions who are interested in starting a research career with those undergraduates. She followed that with a decade of service on the Committee on Professional Training of the American Chemical Society and was fortunate to participate in a dramatic modification of the guidelines that shape chemistry curriculum in the US. Since 2010, she has chaired the first strategic planning process at Trinity University for more than 40 years. Photo credit to Don Hamerman of Trinity University.